Catholic Bible 101 - The Bible Alone? One of Martin Luther’s invented theories from the 16th century was that “The Bible Alone” is all that is necessary to understand God’s Holy Word – No Pope, no Magesterium, no man, no woman, no university, etc., is necessary to understand what God meant to say in scripture. A scholar, a milkmaid, a janitor, a slave, a freeman, etc., can all grasp the complete meaning of scripture without any other aid or person. Why? Because in Luther’s mind, the Holy Spirit comes to each of us to impart the truth, whether we are scholars or not, whether we understand Latin and Greek or not, or whether we are holy or not. But we all know that this isn’t true. For starters, there is the King James Study Bible, complete with “doctrinal footnotes.” Doctrinal footnotes “explain” the meaning and context of certain parts of the bible that the average reader may not know about. But if “the Bible Alone” is all we need, then why are “Doctrinal footnotes,” which are NOT scriptural, added to scripture to explain it? Is the Holy Spirit asleep or something? Why are man-made footnotes even needed if “The Bible Alone” is all we need? And if “the Bible Alone” is indeed a true philosophy, then why do some Lutheran Churches like the ELCA say that practicing homosexual ministers are OK, and other Lutheran Churches like the Missouri Synod say that they are not? Both Churches are descendants of Martin Luther, and they both use “the Bible Alone” as their method of studying scripture. There are approximately 33,000 different protestant denominations today, all using “the Bible Alone” as their tradition. But they all interpret the bible differently, or they wouldn’t be a different denomination. Is the Holy Spirit divided? Just for fun, let’s use the King James Bible and the tradition of “The Bible Alone,” and see what we come up with. We won’t use any other reference sources, because to do so is to admit that “The Bible Alone” is not true. -- Using “the Bible Alone” theory, we can conclude that unicorns are real creatures, not imaginary. -- Using “The Bible Alone” theory, we can conclude that traditions are good, whether they are written or whether they were orally taught. -- Using “the Bible Alone” theory, we can conclude that God will judge us according to our deeds. -- Using “the Bible Alone,” we can conclude that the dead will be judged according to their works. -- Using “the Bible Alone,” we can conclude that there are indeed righteous people in the New Testament besides Jesus. Hebrews 10: 26-29: For if we sin willfully after that we have received the knowledge of the truth, there remaineth no more sacrifice for sins, But a certain fearful looking for of judgment and fiery indignation, which shall devour them. He that despised Moses' law died without mercy under two or three witnesses: Of how much worse punishment, suppose ye, shall he be thought worthy, who hath trodden under foot the Son of God, and hath counted the blood of the covenant, wherewith he was sanctified, an unholy thing, and hath done despite unto the Spirit of grace? -- Using “the Bible Alone,” we can conclude that people can indeed lose their salvation after having been “saved,” and the “once saved, always saved” philosophy is unbiblical and a tradition of man. -- Using “the Bible Alone,” we can conclude that scripture is hard to understand, and we need someone from the Church to explain it to us. -- Using “the Bible Alone,” we can conclude that every Israeli ever born, including Caiaphas and Judas, will be saved. All means all, after all! 1 Corinthians 3:13-15: Every man's work shall be made manifest: for the day shall disclose it, because it shall be revealed by fire; and the fire shall try every man's work of what sort it is. If any man's work abide which he hath built thereupon, he shall receive a reward. If any man's work shall be burned, he shall suffer loss: but he shall be saved; yet so as by fire. -- Using “the Bible Alone,” we can conclude that on our judgment day, some will be saved after undergoing a trial by fire, and some will go directly to heaven with no purifying fire. -- Using “the Bible Alone,” we can conclude that it is OK to refer to men as a “father." -- Using “the Bible Alone,” we can conclude that Timothy and Titus were the blood brothers of Paul. -- Using “the Bible Alone,” we can conclude that a church must have an altar and a tabernacle, which provides sacred food that unbelievers do not have a right to eat. 1 Corinthians 10: 16-21: The cup of blessing which we bless, is it not the communion of the blood of Christ? The bread which we break, is it not the communion of the body of Christ? For we being many are one bread, and one body: for we are all partakers of that one bread. Behold Israel after the flesh: are not they which eat of the sacrifices partakers of the alter? What say I then? that the idol is any thing, or that which is offered in sacrifice to idols is any thing? But I say, that the things which the Gentiles sacrifice, they sacrifice to devils, and not to God: and I would not that ye should have fellowship with devils. Ye cannot drink the cup of the Lord, and the cup of devils: ye cannot be partakers of the Lord's table, and of the table of devils. -- Using “the Bible Alone,” we can conclude that the Eucharist is the body and blood of Christ and not symbolic, and it is a sacrifice akin to the altar sacrifices of the Jews and the Gentiles. Otherwise, Paul would not have compared it to them. This is just a sampling of what “the Bible Alone” theory offers. Most protestants will tell you that what YOU have come with using “the Bible Alone” is erroneous, while what they came up with using “the Bible Alone” is of course infallible. 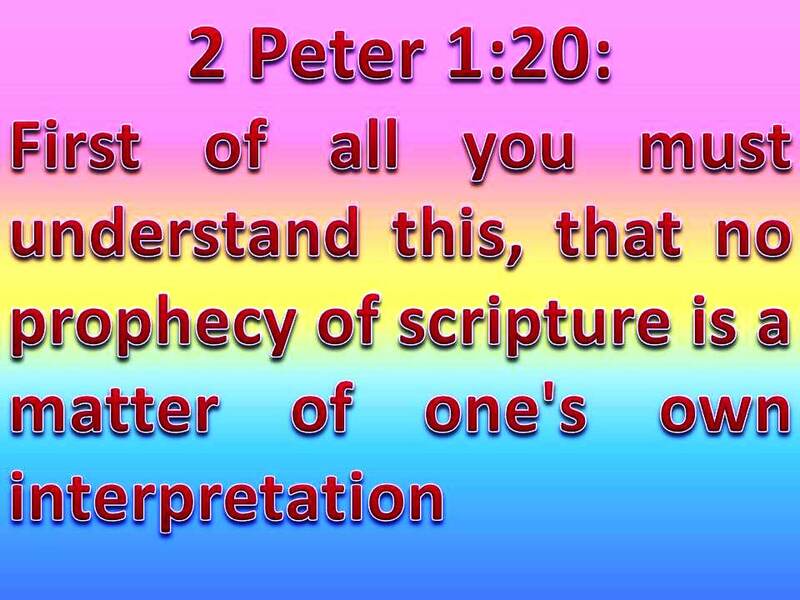 But that argument fails on two counts – first, if “the Bible Alone” is true, then whatever one comes up with is true, since the Holy Spirit is guiding that person, and second, if no person is infallible, like they claim about the Pope, then how can what they come up with be infallible?